We are sad to report that Sue Gray died last week. She was a trustee of TFSR Cymru from 1999 to 2002, our Chair in 2002, and an active volunteer member for many years. 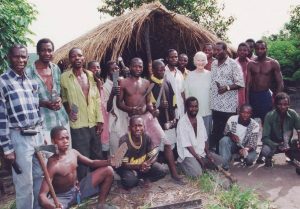 She is seen here with Ikulwa blacksmiths group in 2004? Next to her is Joseph Mashinji who became a good friend and an influential blacksmith throughout Tanzania. We all have fond memories of Sue and will miss her so much.